Hi lovelies! Today I thought I'd share with you all a few of the lovely things I got for Christmas this year. I got lots of lovely bits and bobs from my friends and family, but in this post I just wanted to share a few bits and pieces with you all instead of doing an entire 'what I got for Christmas' post, as I don't want to come across braggy (aaaand I've already used/ put away a lot of my presents and getting them all together to photograph seems too much like hard work!!). So, first up is this gorgeous Ted Baker purse, which was a gift from my lovely boyfriend Darren. I love the baby pink and white design, it's lined with the classic Ted Baker french bulldog lining too, this purse could literally not be more perfect for me! This HP Laptop was my main gift from my parents (Santa) this year, which I actually got a little bit early, as my poor old Dell finally gave in and died forever. This one is just perfect though, windows 8 is a little difficult to get used to, but it's super fast and has a lot of storage, making it perfect for blogging! This gorgeous perfume is the Juicy Couture 'Couture La La' perfume and it was a gift from my Grandparents. I love getting perfumes for Christmas and this one had been on my wishlist for quite a while. I love the scent of this one, its super girly and fresh and the bottle is just beautiful. It always helps when a bottle looks good on your shelf doesn't it? Many of you will already know that Darren gave me an early Christmas present this year, which was the Yankee Candle 12 Christmas Sampler set. 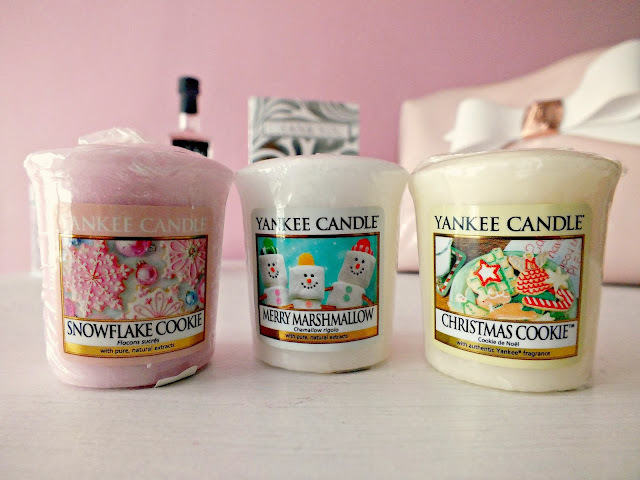 These scents are my absolute favourites from the set, 'Snowflake Cookie', 'Merry Marshmallow' and 'Christmas Cookie'. I'll definitely be picking up more of these in the sales as they're all so yummy smelling and it makes me sad that they're only around at Christmas time. This stunning YSL gift set was a gift from my Grandparents and I looove it! I adore Touche Eclat, but my purse cries when I have to buy it myself, so it's such a fab thing to receive for a gift. This set also comes with a mini Mascara, which is really lovely. I'm not sure which mascara it is exactly, but I really love it, it's super black and clump free, which is great for those mornings when you don't have too much time to do your make up and it's pretty fool proof! This lovely little Benefit kit was a gift from my sister Hannah, this is the 'Cabana Glama' kit, which I was suuuper excited about for two reasons, one, it's Benefit (duh) and two, it contains 'Hoola' Bronzer. I'd never tried 'Hoola' before and this is a perfect way to give it a go before taking the plunge and buying the full size. It also contains the 'Some Kinda Gorgeous' foundation in medium, which looks like a perfect summer shade/ fake tan shade for me, 'Posie Tint', which is an old favourite of mine and three beautiful eyeshadows. Why had I not tried Benefit shadows before? These are just perfection, I feel like I need more Benefit eyeshadows now, these are just so buttery soft and gorgeously pigmented, amazing, just amazing. Darren got me lots of little makeup bits for Christmas this year, all chosen by himself believe it or not. So, with a little help from the Benebabes at our local boots, one of the things he got me was the 'Boi-ing' Concealer, which I'd tried before in a mini size and loved. He knew I'd used it before as it was in the 'How to look the best at everything' kit that he got me and he knew I loved that, so he asked the girl if he could have it in full size, so I was super proud of him for doing some detective work there! Take a moment to absorb the cuteness. Done? This little lunch box tin was a little stocking filler from my parents and I just love it. Boo the dog is my hero and I'm in love with this. Another gift from Darren is this super adorable little Me to You bear dressed as a snowman. It may be Christmassy but this gorgeous little guy is definitely staying on my bed all year round. I never grew out of the teddy bear phase and I love receiving them so much so this was really lovely of him. A bit of a strange one to show you all, as this isn't really a 'big' present, but I wanted to share the awkard but funny story with you all. I don't know about anyone else, but every single year, my mum gets me and my sister underwear as a stocking filler - and every single year, we open them under the table/ behind our backs to avoid awardly flashing lacey knickers to our Grandparents! I do love these though, she chose some super cute ones this year, so awkwardness aside I was pleased with these! I'm so grateful for everything I received this year, I loved absolutely everything that my friends and family had chosen for me. If by any chance you are a friend or family member reading this post and I didn't include your gift, it's probably because I've already opened it/ used it or put it away and it in no way means I didn't love your gift just as much as these ones!! What do you think? What did you get for Christmas this year? You got some beautiful gifts, and your boyfriend really did good! My dell laptop is starting to pack up now too, so I think 2014 will be the year to get a new one! Lots of great gifts,I've been wanting boing for so long now! I have a wax tart of Merry Marshmallow, it's gorgeous. Sounds like you had a great Christmas !! You got such lovely things! Lovely gifts and I love your purse the most and think it is such a gorgeous gift to get! Wonderful presents, Chloe! We don't have much Ted Baker here, but it's quickly coming one of my favorite brands. I love the baby pink and the French Bulldog logo (two of my favorite things! ), so I will be making space for more of his items soon. I too just purchased Hoola bronzer not too long ago and I really, really like it! It's definitely worth all the hype. Have yet to try YSL (my wallet also cries), but I'd love to save up and purchase a little something from that line one day!